The game had a very big importance for third-ranked Ruckers as it allowed them to take a leadership position. Ruckers defeated their biggest opponent SCVU at home 92-84. It was a key game for the top position in the league. Ruckers have a solid series of three victories in a row. As mentioned above they are alone now at the top position. SCVU at the other side dropped to the third place with three games lost. Both teams do not play next round, which will be an opportunity for some rest. The game with biggest result difference took place in . 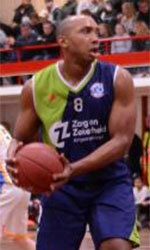 Local De Schakel (5-4) outscored 6th ranked Finabank (1-9) 75-34. De Schakel have a solid series of three victories in a row. They maintain fifth place with 5-4 record. Finabank lost fourth consecutive game. They keep the sixth position with nine games lost. Both teams do not play next round, which will be an opportunity for some rest. In the last game of round 13 Finabank was defeated by De Arend in a road game 72-61. There was no surprise when 6th ranked Finabank (1-9) was defeated on the road by fourth ranked De Arend (6-4) 72-61. De Arend maintains fourth place with 6-4 record. Finabank lost fourth consecutive game. They keep the sixth position with nine games lost. De Arend will play against league's second-placed Yellow Birds in the next round and it will be quite challenging to get another victory. Finabank will have a break next round. Hoofdklasse is at the halfway of the Regular Season and there are still another 12 rounds left. Here is the last round review presented by ESL. The most crucial game of the last round was a loss of SCVU (7-2) at the home court on Sunday night. Hosts were defeated by Yellow Birds (7-1) 72-63. It ended at the same time the two-game winning streak of SCVU. It was a key game for the top position in the league. Defending champion keeps a position of league leader. SCVU at the other side dropped to the second place with two games lost. They share the position with Ruckers. Yellow Birds will have a break next round, and it should allow them to practice more before next game. SCVU will play against Ruckers and it may be a tough game between close rivals. An exciting game was played in . Third ranked Ruckers faced 4th ranked De Arend. Host Ruckers (7-2) defeated guests from (4-4) 75-67. Ruckers moved-up to second place, which they share with SCVU. De Arend at the other side keeps the fourth position with four games lost. They share it with De Schakel. Ruckers will play against league's second-placed SCVU in the next round and it will be for sure the game of the week. De Arend will play against Finabank and it may be a tough game between close rivals. Bottom-ranked CLD (0-9) tried to put together a comeback for its first victory of the season, but they fell short in the 136-71 loss to third ranked Ruckers (7-2) in on Sunday evening. But it was rather predictable considering how strong their opponent was. Ruckers moved-up to second place, which they share with SCVU. Loser CLD still closes the standings with nine games lost. Ruckers will meet at home league's second-placed SCVU in the next round and it will be for sure the game of the week. CLD will have a break next round. The game had a very big importance for second-ranked SCVU as it allowed them to take a leadership position. SCVU smashed 6th ranked Finabank at home 88-68. As mentioned above they are alone now at the top position. Finabank at the other side keeps the sixth place with seven games lost. Finabank will have a break next week, which should allow them to rest in order to get back on the winning path. SCVU will try to continue on its current victory against second ranked Yellow Birds at home. Very important is a home loss of third ranked Ruckers (5-2) against fifth ranked De Schakel (4-4) on Thursday night. Host Ruckers were defeated by De Schakel in a tough game at home 75-80. De Schakel maintains fifth place with 4-4 record. Ruckers at the other side keep the third position with two games lost. De Schakel will have a break next round, and it should allow them to practice more before next game. Ruckers will play against CLD and hope to get back on the winning track.